A friend recently related how she had come across the decapitated corpses of two Spotted Eagle Owl chicks on a suburban road. Highly distressed by the discovery she approached a nearby construction site to confirm her worst fears. “Sangomas will pay a lot of money for them,” she was told. It is easy to become angry at such ‘barbarism’ as my friend did. But what end does that serve? Over the years I’ve come to realise that by placing abstract values on a situation one can distance oneself, thereby encouraging that distancing in others, to keep the assessment in the realm of the non-personal. Out of the impersonal creative solutions can then arise. So why would owls be so desirable to sangomas? In most, if not all, indigenous African societies owls are seen as a ‘witch’s bird’. If you emulate the call of an owl people will often scold you and ask: “Are you a witch?” There is magic and sorcery in owls. Owls are flying birds (i.e. universal symbols of transcendence) that see in the dark. They have the very attributes that sangomas need for their profession – they need to rise above the personal and they need to see into the dark recesses of the patient’s mind to determine the cause of the problem and prescribe a remedy. And there is an additional feature – owls’ faces are generally white or pale in colour. Many sangomas will paint their faces white when consulting a patient or conducting a ritual. I believe this has a similar root to coating the face or body in ash. The clue here is in the colour white. White is all colours i.e. the everything colour or the colour of God. That’s why it’s the symbol of purity. Also, and most importantly I think, it is a colour that reflects. For those who consult the ancestors through a sangoma (remember the ancestors are intermediaries to God) their own psychic patterns will be reflected back at them, just as a psychologist mirrors the mind of a patient. Therefore, in the minds of traditional Africans, owls are the animal equivalent of sangomas and their special powers of psychological insight. By acquiring, displaying and utilising owl parts (heads in this case), a sangoma will shore up his/her own power. 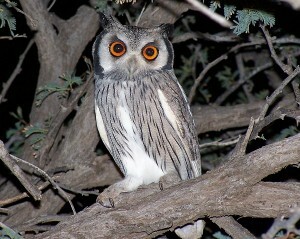 Owl power is essential for being an effective sangoma. How can this help owls? By acknowledging the symbolic power of owls, one can then engage with sangomas in a detached, unemotional manner to find ways to protect the species. A potent modern substitute for owl power can then be found. I wouldn’t like to hazard a guess as to what sangomas would find sufficiently appropriate, but starting the conversation, and throwing a few ideas around can’t be detrimental to the owls’ cause. P.S. This article might be pertinent to projects like the one in Alexandra Township, where owls have been introduced to control the rodent population, only to have the owls killed.